Whether you’re a new homeowner or are simply thinking about renovating your home, the kitchen is undoubtedly one of the most important rooms in the house. A well-designed kitchen needs to be durable and able to last over the years, standing up to a considerable amount of wear and tear. 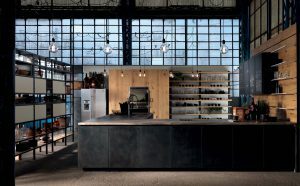 This is where Aster Cucine comes in – kitchen designs from Italy that are stunning and innovative, able to fulfill both your aesthetic and functional needs. 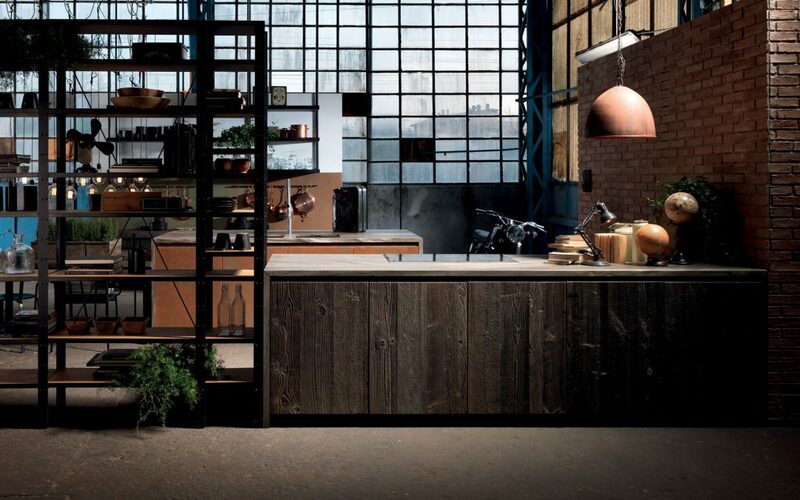 The mission behind Aster Cucine kitchens are simple yet profound: to create designs and spaces that are personalised for each client, avoiding lack of personality by choosing to tell a story for each individual in creating a space that they feel comfortable in. The model which is currently at the forefront of Aster’s collection is undoubtedly Factory. Like every Aster model, the Factory collection is made of different modules in endless possibilities of materials and finishes, so one can describe it as a work-in-progess workshop for exploring different ideas and materials, juxtaposed to create very different, unique, eclectic pieces. No Factory kitchen will ever look the same as another. 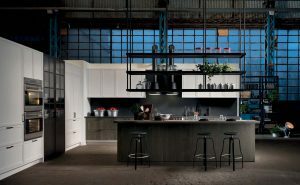 Materials that have a history are characteristic of Factory kitchens – think re-purposing and upcycling. One of the materials used is reclaimed wood from abandoned bridges – how unique is that? The warmth and character of this wood creates a stunning, stark contrast against Corten oxidised steel, gunmetal and mesh-panelled door fronts. 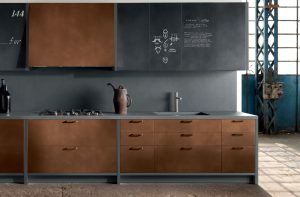 Or how about blackboard fronts teamed with the natural unpolished feel of knotted oak or copper, and aging iron shelves in contrast to shiny new technology? By bending the rules and making them work to put a spin on the conventional, Aster Cucine creates spaces that are both beautiful and durable. 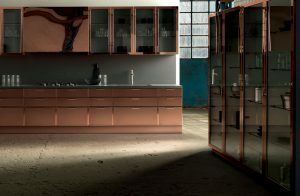 Contrasts of different styles and materials not only break the rules but are key to Aster Cucine’s vision. You might not be adventurous enough to go as far as having shiny copper fronts across your kitchen, but making a statement need not mean going too far out of your comfort zone. After all, most people spend the majority of their time at home in the kitchen so you need to be comfortable with your choices for the long term. Coupling white panelled doors with natural woods, anthracite greys, touches of antique bronze and aged handles might be just about enough for you, and that’s great! 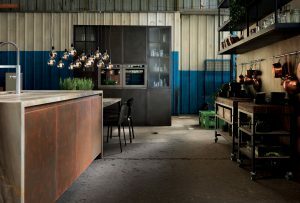 In Factory, raw materials are blended with sophisticated finishes, and this is what creates the magic – the pure clean lines of iron, the honesty of reclaimed wood and the robustness of marble – all come together in an ideal space where everything works to create something wonderful, something you can truly call your own. 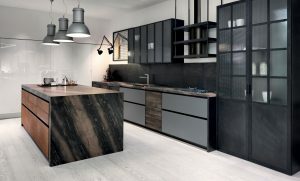 For a contemporary, unconventional solution to all your kitchen requirements, contact us at Brands International Ltd, and we’ll be happy to help you create the Aster kitchen of your dreams!